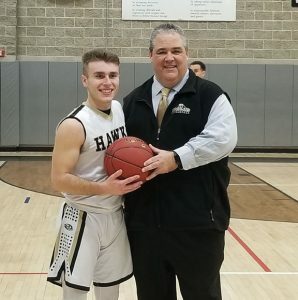 BEACON FALLS — Four gold balloons — a one and three zeroes — floated behind the bleachers at Woodland for minute after nerve-racking minute during the Hawks’ basketball game against Torrington on Jan. 18. All Zach Bedryczuk needed was four points to become the second player in Woodland’s boys hoops history to reach 1,000 points for his career. But with the Hawks seemingly playing on eggshells — and his sign-wielding friends in the student section gasping and groaning with every stray 3-point attempt — it seemed as though the wait would be interminable. But finally, late in the second quarter, Bedryczuk hit his second triple of the game to push him past the 1,000-point plateau, triggering a minute-long celebration with his teammates, coaches and family. One of those teammates is fellow senior Justin Marks, with whom he’s played every sport since their days in Beacon Falls’ youth leagues. The fact that it took so long to achieve against the Red Raiders was a product of the nerves among everyone on the floor, according to Woodland coach Tom Hunt. The Hawks were just a little bit off throughout the first half, resulting in a 37-25 halftime deficit and an eventual 75-62 loss. Bedryczuk finished the game with a team-high 19 points. He added eight points in a 77-40 loss to top-ranked Sacred Heart on Jan. 23, 18 points in a 66-64 loss to Ansonia on Jan. 25 and 25 points in a 78-67 loss to Kennedy on Jan. 26, putting his career total at 1,066 points with seven games left in the regular season. Only Tanner Kingsley, Bedryczuk’s longtime next-door neighbor, has more points in his career with 1,312. Bedryczuk said that although he looked up to Kingsley throughout his childhood and entering high school, scoring 1,000 points wasn’t necessarily a goal when he began seeing significant playing time as a freshman. By the end of that season, though, he decided he could do it. Bedryczuk, who’s generously listed at 5-foot-10 on the roster, has spent his career terrorizing opponents from the outside. He drilled four treys against Torrington and another two against Sacred Heart. Bedryczuk’s next goal is a berth in the Division IV state tournament, which will require a few upsets down the home stretch. Woodland is 4-10 with six regular-season games left to play, including a road game Oxford on Tuesday. The Hawks will host rival Naugatuck on Friday. Editor’s note: This story has been updated from the version published in the Jan. 31 edition of the Citizen’s News to include information on games played after press time.